Now I'm not normally the world's biggest fan of pink (a certain dou person springs to mind here, eh @polkadotcupcake, @JulyAte and @mdd1985? ), but there is something about the brilliant deep pink of beetroot that just screams "Hello world!" It's the vegetable equivalent of slapping on some body glitter, slinging on a feather boa and heading out to town in your tear inducing pointy-toed stilettos. Charming and dazzling everyone within 5 feet of your sparkling self of course. Perhaps tossing your thick mane of hair to one side, wiggling your pert little bottom and winking at that cute guy across the room. *Ahem* It seems as if I might've got a tad sidetracked. So, beetroot. Party girl of her generation. Irresistibly pink and earthily sweet, she tends to gravitate towards the dairy kind of man. Preferring salty blue cheese one day, feta the next and tangy, garlic-y greek yoghurt for a bit of variation. Throw in a handful of herbs and miss Beet is happy like a pig in mud. Although, decidedly un-piglike. After all, she is a lady. 1. Slice tops and bottoms off beetroot bulbs, then boil or roast until soft. This can take from 30 minutes to an hour and a half, depending on method of cooking or size of bulbs. 2. Run cooked beetroot under cold water and rub skins off (do this with gloves on if you don't want pink-stained hands). Slice into rounds and set aside. 3. Mix yoghurt and garlic and spread onto a serving plate. 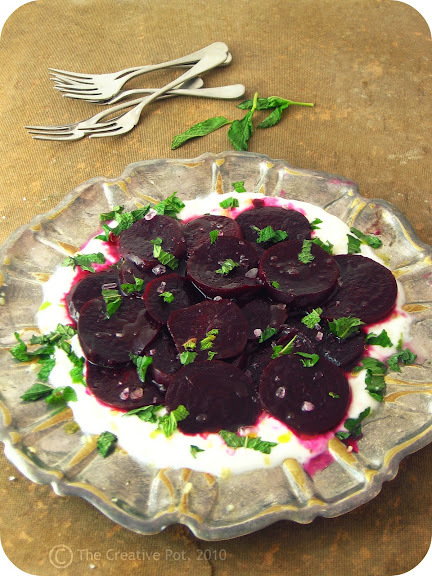 Arrange beetroot slices on top and drizzle with olive oil and lemon juice. Sprinkle salt and chopped mint over and serve immediately. Variation: Pile the whole dish (sans mint) onto a pizza base and bake for 10 minutes at 220C. Top with grated mozzarella, sprinkle with mint and a handful of pumpkin seeds and return to the oven to melt the cheese. Serve warm or cold. Love the pink and white combination. That is just too pretty. A ll of that pink and white swirly goodness. Has to reflect some seriously awesome flavor. And a little bit of glitter and glam of course. I love the pink and white swirls. 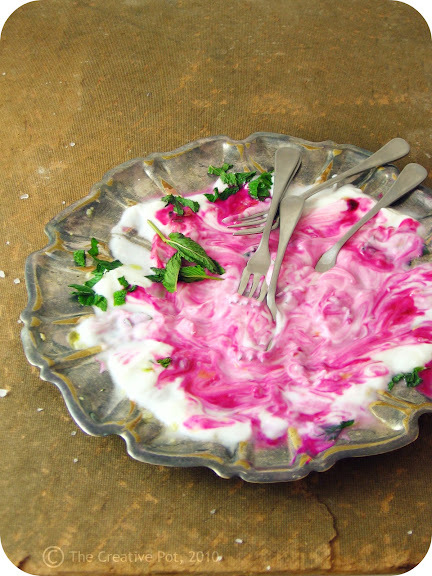 Nice raita that is what we call it for yogurt based dishes. I remember this dish from Claudia ROden! How pretty they look!! Oy, the color is absolutely magnificent!!! I would not leave all the yummee pink yogurt on that plate..Nice plate!!! I scooped all of that up and used it to dunk the rest of my beetroot in! Too pretty to waste. Claudia Roden is a legend. There isn't even one of her recipes that does not scream "make me now!" I love beets!! The color, texture, taste...everything about them. And this recipe looks fantastic, a must try! I have never seen beets look tastier. Amazing!